Cash, Major Credit Cards and Apple Pay accepted! at Francesca Ave. and College Ave.
Come meet your neighbors and celebrate fall! Bouncy house for adults & kids! Face painting! Multi-family yard sale this Sunday 10/16 from 10am to 2pm on four streets in the Davis Square area: Hall Ave, Francesca Ave, Rogers Ave, Highland Road. I know there are at least 5 houses on Hall Ave participating. Antiques, pet supplies, clothing, cookbooks, musical equipment, toys, children's items, books, yoga equipment, baseball cards, kitchenwares, household goods, and more! Multi-Family Yard Sale 9/11 9am-1pm, driveway of 24 Francesca Ave. All proceeds from the sale will go towards buying underwear, socks and other essentials for homeless kids in the Somerville Public Schools. Housewares, toys, books, kid-sized bicycles, lots of treasures. You can also buy a Brown School Community Card (proceeds from those will go to the Brown School PTA) 9am start time, please don't show up early! My neighbors and I are getting together for a joint yard sale on Saturday! Housewares, kids' clothes and gear, vintage gloves, books, games -- you name it! I also have an old Canon AL-1 camera with two lenses in great condition to sell. Let me know if you'd like more information on that. I want to welcome all of you to the estate sale I'm having on Saturday August 8th, 2015 from 10am-4pm, in the backyard of 9 Quincy Street Medford, MA. My grandmother was a museum director and a very cool lady (read more). Her taste was sophisticated and splashy, and there will be many cool pieces for sale. She had extensive collections of art and rare books, and I'll be selling some of these items separately from the estate sale. If you're interested in learning more about them, contact me at brianabean@gmail.com. lots of other fun bits, waaay too much to list. It's on Glenwood Road between Medford and Broadway, look for signs and balloons and stuff pointing the way. After ten years in Davis Square, we're moving on. Many furnitures to pass along. Also lots of freebies to be set out tomorrow - household and kitchen items, women's clothing, kids' clothing, laser printer/scanner/copier, plastic storage drawers, small furniture, etc. We are holding the sale as planned for Saturday!! For Sale: a variety of CDs, DVDs, books (for children and adults), trinkets, housewares, clothing, etc! Most of the participating households have children with a wide range of ages/sizes, so there will be plenty of children’s clothing, games, toys, and puzzles. Saturday afternoon the Boston Zine Fest organizing committee is holding a yard sale at 43 Hall Ave as a fundraiser for this year's event. Correct me if I'm wrong, but it might just be one of the inaugural yard sales of the season! All proceeds go towards putting on an event that encourages literacy and the empowerment of self publishing! Yard sale flyer below the cut. life is short and moves happen. used bookstore for them. Comment or message me if interested. Thanks. Please join us at our Huge Multifamily Yard Sale! BONUS: We can chat about the Green Line Extension. The temporary terminus for College/Boston Aves. is located behind Burget Ave.
Not huge, but more stuff keeps arriving, very cheap. Toys! Baby Stuff! Clothes! Shoes! Come find yourself a new treasure among our old treasures! Neighborhood yard sale, Adams Street in Winter Hill area of Somerville (they didn't put a specific street number). Household items, costume jewelry, board games, clothing, etc... Some, but not all, households will be setting up as early as 8:00AM. We're relocating to Rhode Island next week, so it's gotta go! Enjoy, my lovely locals, you shall all be missed. 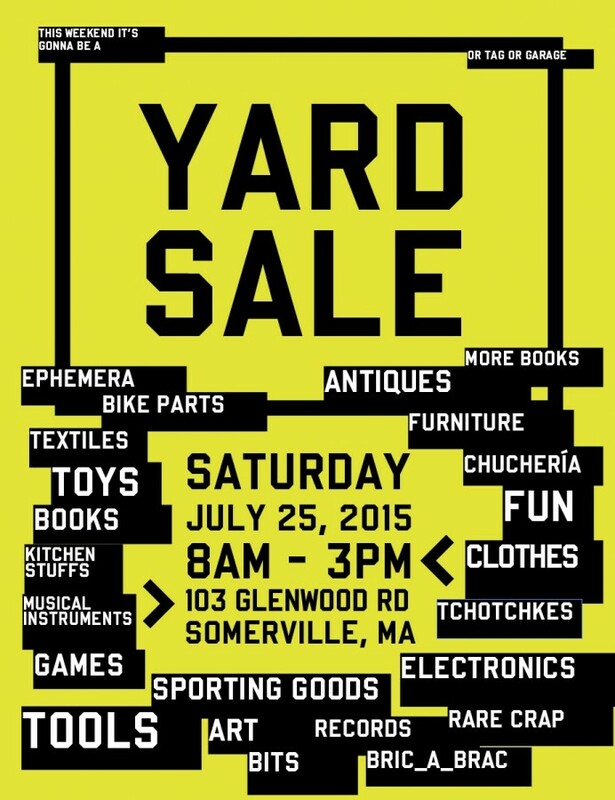 Yard Sale, This Saturday, at the Corner of Orchard St. and Milton St. This Saturday, the 19th, from 10 - 4(ish) we'll be having a yard sale at the corner of Orchard and Milton, steps from the Square. Repost from earlier this week. PS: I'm also hosting a clothing swap the evening before with a secondary aim of consolidating a lot of clothing to appear at the yard sale. Reach out to me in private if you're interested in that event. srakkt.livejournal.com - Yard Sale, This Saturday, at the Corner of Orchard St. and Milton St.